What Is DD Form 1299? DD Form 1299, Application for Shipment and/or Storage of Personal Property is a form issued by the Department of Defense (DoD). The DD 1299 is used by service members and other eligible individuals to request shipment and storage of any personal property at the expense of the government. The form - often incorrectly referred to as the DA Form 1299 - was last revised in September 1998. An up-to-date fillable DD Form 1299 is available for download below. - The DD Form 1797 (Personal Property Counseling Checklist) is used for documenting members and employees within the DPS IAW JFTR/JTR entitlements and service regulations. The counseling can be completed through the Official DoD Moving Portal or in person. Download and file copies of the DD 1299 and DD 1797 and hand them in at the local Transportation Office (TO). The TO can assist you with completing all of the paperwork. How To Fill Out Dd Form 1299? Where To Sign Dd Form 1299? I certify that I have read and understand my shipping responsibilities and storage conditions printed on the back side of this form. household goods, mobile home, and/or professional books, papers and equipment authorized to be shipped at government expense. AUTHORITY: 37 USC 406, 5 USC 5726; and E.O. 9397.
case goods to be shipped exceed Government entitlement limits. mobile home in condition to withstand transportation. States are provided in Chapter 10, JTR. point of origin (or port, if any) and destination. necessary in the performance of official duties. excess costs occasioned by this shipment. effect disposition of the household goods. convenient or necessary to store the household goods. article or package as listed on the warehouse receipt. remove the household goods from their place of storage. their household goods while such goods are in storage. 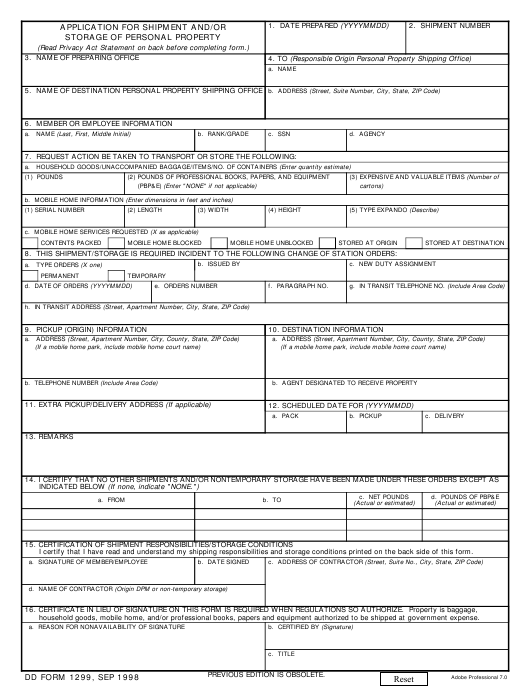 Step-by-step DD Form 1299 instructions are included in every Department of Defense-issued copy of the form. The document includes the addresses of both of the shipping offices that should be contacted when moving. You can receive help with moving preparations at the origin office. The destination office will provide assistance in case any of the moving plans change or you need to submit a post-move claim. The first step in filling out the DD Form 1299 is providing your personal data. The next step is to estimate the weight of the goods that should be moved in pounds and indicate the number of cartons containing valuable items. The maximal weight you are eligible for is based on your rank and you will be charged for every pound above the limit. If you are moving a mobile home, provide the details about it in Lines B and C in Box 7. Do not forget to double-check all the addresses entered to make sure they are correct. All service members are advised to designate an agent who will receive the moved property in case they will be unable to do so themselves. Sign the form in Box 15a and indicate the date of signing in Box 15b for the completed DD Form 1299 to be valid.